Welcome to the 37th Season of Impromptu Concerts! 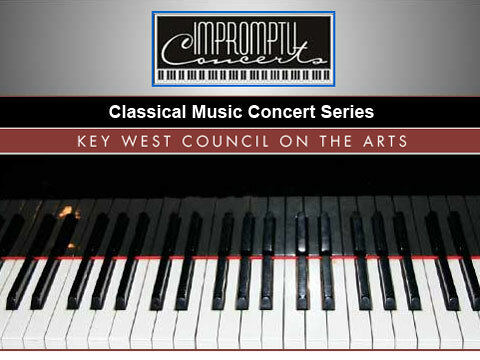 All of us on the board of directors of the Key West Council on the Arts welcome you to our 37th season of Impromptu Concerts, and extend our sincere thanks for your enthusiastic support through the years. Our program schedule for this year continues the tradition of musical variety, outstanding performers, and modest admission prices that have made the Impromptu Concerts series a favorite in Key West and the Lower Keys. Highlights of the coming season include a spectacular opening performance of Schubertâ€™s â€œOctet,â€ performed by the Daedalus Strings in collaboration with the Wind Soloists of New York; our â€œRising Starâ€ performance by 14-yr old pianist Peng-Peng Gong; and our presentation of the highly acclaimed A Far Cry Orchestra, at Tennessee Williams Theatre. Rounding out the year will be the Cypress String Quartet, and return engagements of the New Century Sax Quartet, and pianist Jeffrey Chappell. Youâ€™ll find more information about our performers, and Impromptu Concerts, on this website. Again, our thanks for your continuing interest, and generous support! Key West Council on the Arts, Inc; a Florida Not for Profit Corporation. The purpose of this council is to promote and provide for citizen appreciation and enjoyment of artistic and cultural activities including, but not limited to music, theatre, dance, painting, sculpture, individual performing and creative artists: to increase the awareness and importance of the arts to our citizens through educational, experimental, cultural, and artistic programs, projects, and services; and to act in general on the principle that the arts are primarily a matter for local initiative.